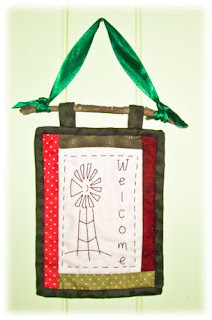 A Present, Prizes & A Peek!! Gear Up For A Give Away!! 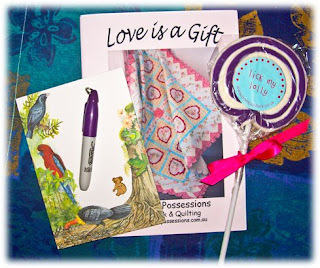 Gifties, Goodies & A Finish! 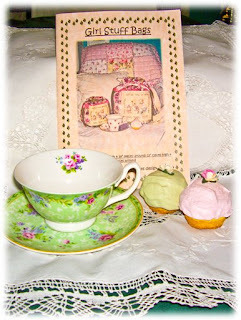 A few posts back, I shared some photos of some of my stitching treasures with you - including some yummy antique laces. My blogging buddy Judy suggested maybe I should try my hand at some crazy patch blocks and incorporate some of my laces. Well ... it just so happens that I actually already HAVE 12 crazy patch blocks all sewn and partly embroidered, so I don't think I'll be making more soon, but I promised Judy I'd share some photos. I love the grape vine on the right of this block and the wreath towards the top. 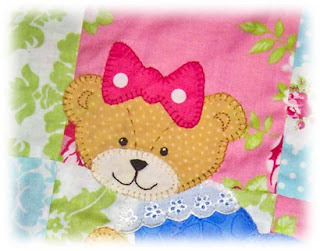 And do you see that little bear on the blue satin background? Cute, huh?!! I haven't done a lot of embroidery on this block, but love the shiny variegated thread I used to do the big leafy things on the right - I've saved the photos at a bigger size than usual so you can click on them to see the details a bit clearer. There's a "K" for "Kris" on the left there, and I love how the peacock feathers came up on the right. I also love the effect of the multi-coloured fly stitches up the top there. Robyn showed us this little trick - each time you finish some embroidery somewhere and have just a little length of thread left, pop in a few random fly stitches. With all the different colours, over time, it builds up into a really cool rainbow effect. There's an "S" for my Sweetie - Scott. And I love how the Sturt's Desert Peas came up in that top section - a native flower here in Australia that is truly spectacular to see in person. I love the effect of the block on the left - using three lazy-daisy stitches, I created a leaf shape and then did them in all different autumn tones - looks like a tree dropped all it's autumn finery, doesn't it! And I was really happy with how the strawberries came up at the top there, as well as the lavender bush to the right. Another "K" for "Kris" and can you see the crazy cows to the right on the green background? I embroidered them rows of stocks flowers to munch on. Here's a green 'spring' version of the leaf effect, on the right, and a spray of fuchsia's at the top left that I was really happy with how they came up. 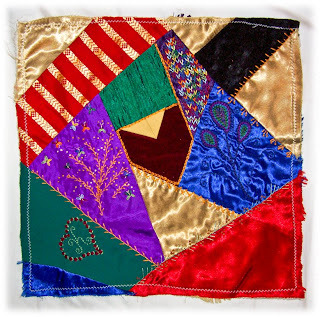 This is the large sample version of a crazy patch Christmas stocking for a class I taught at our church craft group some years ago. 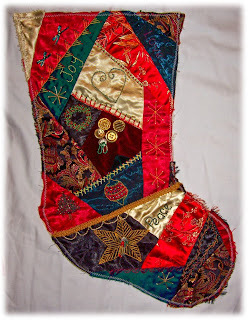 This stocking is about 50cm long, so once I actually FINISH it, Santa will be able to put LOTS of goodies in there for me!! All of the embellishments are finished - I just have never got around to putting a backing and binding on this. 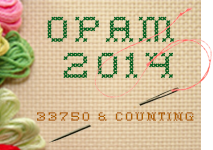 Maybe I need to make this one of my finishes for the OPAM Challenge!! 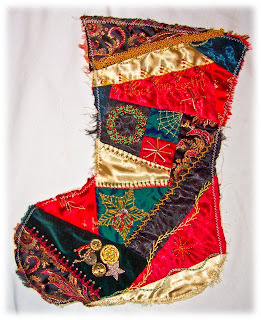 And this is the smaller version of the Christmas stocking, only about 20cm long, so not so many gifties will fit - though small, shiny jewellery boxes would fit nicely! Tee! Hee! Hee! This one, too, just needs the back and binding done - I really should do that!! I think I put off finishing these because I was trying to work out whether I wanted to line them or not, but perhaps I just need to do backing and binding to get them finished! So ... there you go Judy! That's some of my crazy patch blocks (I have a few more with the piecing done, but no embroidery yet). 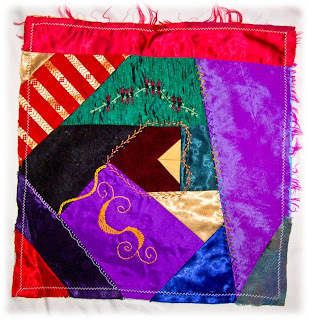 I loved working with these blocks - I love the depth of colour and textures of the satins, velvets, brocades and silks that I worked with - I particularly wanted to get that rich, exotic and luxurious "harem" kind of feel about them, which I think I achieved. Of course, there is so much more embroidery to do on them that I may be a little grey-haired old lady before I ever get to snuggle under my Harem quilt, but that's part of the fun of stitching! I did manage to finish a long-term project yesterday, but it's a secret squirrel one for now, so can't show you yet, but will do so once it reaches it's new home. OPAM gals, don't forget to UPDATE your sidebar lists of your finished projects for April and if you have a chance to email May Britt or I with the number of projects you've finished this month, that would be great too. 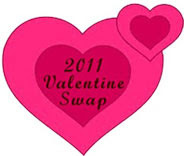 May Britt will be choosing this month's winner, so stay tuned!! And now ... I'm off to find a pair of snuggly socks, cos autumn is starting to make itself known here on top of our hill (you know, that little series of 'hills' we like to call The Great Dividing Range! Tee! Hee! Hee!) and my toesies are feeling a bit icy. Hmmm ... Karen sent me a SUPER pair of stripey socks in the SSCS, so I think it's time to give them a test drive! Stay warm and til next time - Bear Hugs! Friday dawned (much earlier than I think a day off really should!!) bright and sunshiny with just a hint of winter in the air. 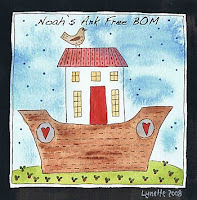 The perfect day to pack myself up and drive down the hill to Brisbane to catch up with my bestest buddy, Lynette, for a play date! So ... off I toodled! After some delays due to some roadworks and an accident where a little white hatchback discovered that bumping into the back of a 4WD was like a mouse trying to move an elephant (no one was badly hurt!) ... 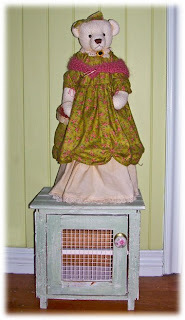 I arrived on Lynette's doorstep and we began plotting our path to visit another friend ... the Lovely Lilly Linda at Lilly Cottage!! YAY!! Double play date!! I'm the short one in the middle! SIGH!! Can you see ... Linda and I have matching hair colour at the moment!! :0) And look at all those treasures in the background - bet you could play Find It Friday with this photo!! It was such a relaxing way to spend several hours - drinking coffee and eating fresh-cooked yummies from the Bakery two shops down (I can recommend the custard tarts and Lynette looooooved her caramel tart!!) and generally forgetting the rush and bustle of everyday life - at least for a while! The only drawback was Linda's 'good luck' run-in with some local wildlife! Tee! Hee! Hee! Here it is in our lounge room, the perfect platform for Elegant Ella to stand on and look gorgeous! Thank you so much for a FABULOUS morning of fun, laughs ... and yummy baked treats ... Lovely Linda! We had a wonderful time and hope to plan a return trip in the not-too-distant future! 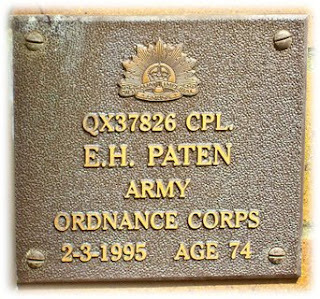 Who knows, next time we visit, we might even get around to seeing what ELSE is at Old Petrie Town! Tee! Hee! Hee! If you find your self in the vicinity of Old Petrie Town and Lilly Cottage - or want to plan a relaxing excursion, I can HIGHLY recommend it!! 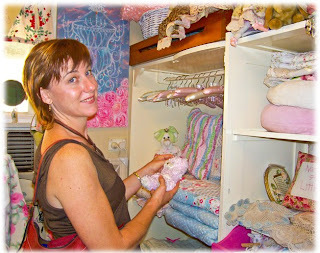 And if you're too far away for an 'in person' visit, pop in to visit Lilly Linda to see her GORGEOUS goodies - she has some SERIOUS eye-candy in her shop and shares LOTS of photos on her blog!! So ... there you go! That's how I spent my Friday! What could be a better way to enjoy our mild Autumn weather than a fun-filled play date with friends! 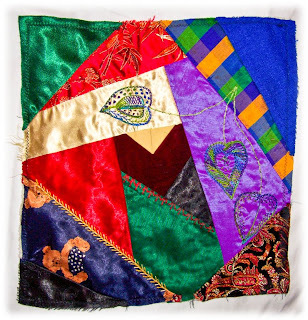 Hope you've had a great weekend - I'll be back in the next day or so with another sneaky peek of my quilt-in-progress and to share some crazy-patch photos that Judy wants to see. 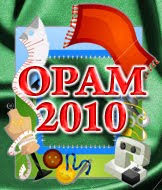 OPAM gals - don't forget to send your end-of-month reports to May Britt or me in the next few days! Til next time - Bear Hugs! 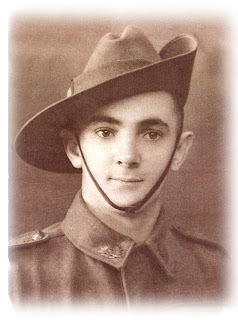 In Loving Memory of Edward (Ted) Paten who served in WWII in the tropics of New Guinea. That's a very TECHNICAL term for what I'm going to share in this post, of course! Tee! Hee! Hee! 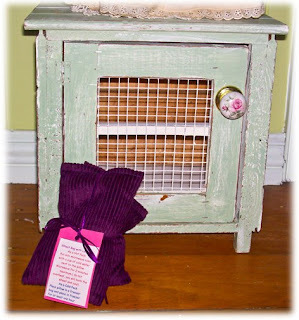 A few days ago, Julie over at Provincial Patch shared how she placed an ad in her local paper telling folks she was wanting to buy/adopt vintage sewing paraphernalia (big word!!) 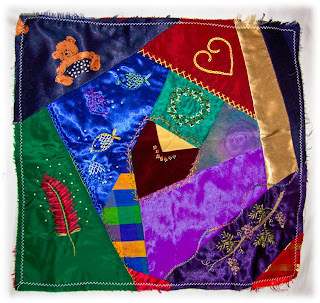 and she showed some photos of a few of her stitching treasures. I mentioned in passing that I had a little collection of stitching treasures, too, and Julie encouraged me to share ... so ...! Don't you love the tin?! I was given this tin by a friend when we lived in Bourke - they'd bought a house from an elderly lady who was returning home to the USA after living in Bourke (in that house!) for about 50 years and so she was travelling light and left a LOT of 'STUFF' in the house. 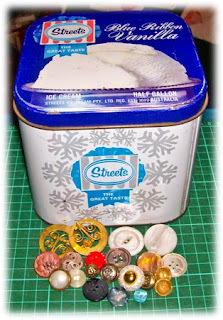 This tin and another box were full of BUTTONS!! Some were pretty ordinary, some were quite old and some were really pretty and detailed. 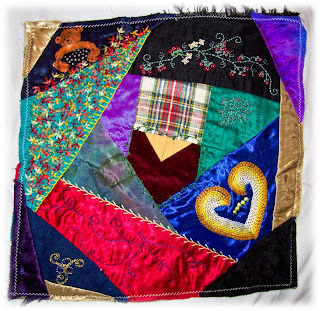 I actually gave quite a few to a fellow quilter who collects buttons - before I really appreciated what a treasure I had and started adding to it! I have wonderful memories of playing with Mum's button bottle as a child ... and that fascination still stands! Tee! Hee! Hee! Here is part of my ric-rac collection - some of these are still on their original cards and several are a mix of two colours - pretty! Here are some of my vintage laces. I love the wide, white crochet lace on the right - I have a length of about 2m of it that I will one day find just the right project for. 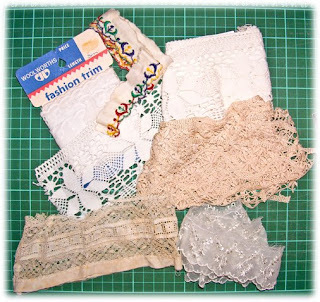 The dark ivory lace is so soft and intricate, but one of my favourites is the piece on the left - I think it was once a cuff from a piece of vintage clothing - before you hang me ... I didn't remove it, I bought it in a bundle of old laces as it is. Here are a couple of my big wooden spools. They are part of the collection of 'bits' that go with my little Thumbelina spinning wheel. 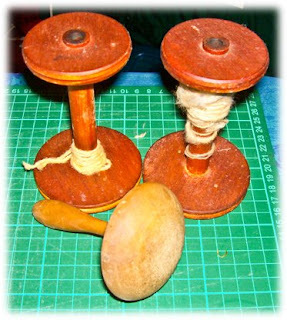 And that isn't a magic mushroom, it's a darning mushroom that belonged to my beloved Geek Boy's grandmother - looks pretty good with my spinning wheel bits! 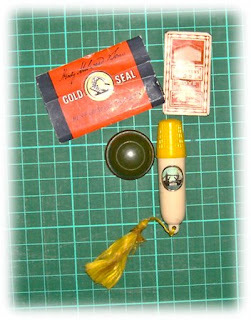 The top treasure is a little travel sewing kit. You can't see it in the photo, but the picture on is is London Bridge and it has "London" written on it. 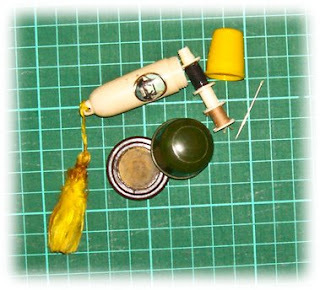 The thimble screws onto the tube to act as the lid and inside is a cute cotton reel that has a hollow centre to store a needle or two. The other little "thing-a-ma-bob", I've been told, would have held wax to run thread through to stop it tangling and help it run through the fabric easier. Does anyone know if this is in fact what it would be? 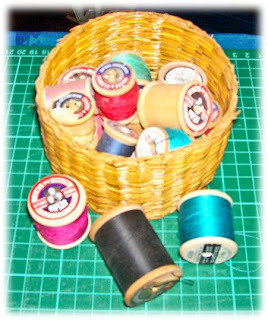 So ... there you go, some of my sewing treasures. 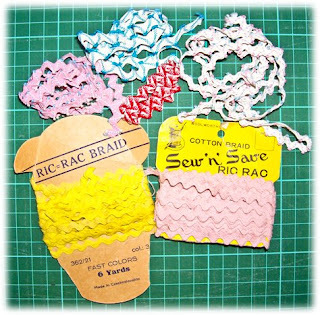 It's a nice link to have these vintage sewing bits and bobs, as it gives me a sense of connection to the stitchers who've come before me - some family members, some not. I wonder what stories these treasures could tell if only they could talk?!?! 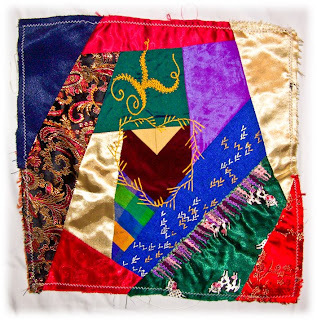 Pop over and have a look at Julies ever-growing collection of vintage sewing treasures, too - it's well worth a peek! Back to some present-day stitching! Til next time - Bear Hugs! 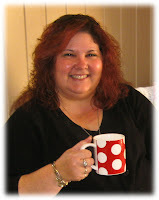 Well ... it's been over a week since I popped into blogland to chat (well, on MY blog, anyways!!) and it's been a very busy week - which explains my absence! We headed three hours north west for Easter to my home town of Mundubbera to spend the long weekend with my folks and had a WONDERFUL weekend! We didn't do very much at all, really, except relax and kick back. There was a 1000 piece jigsaw puzzle on the table that we all worked on throughout the weekend here and there, we watched a few movies, ate lots of Mum's home cooking, read and I managed to do some stitching on my quilt-in-progress. (more on that later in the post!) All in all, it was a lovely way to spend Easter and since Scott had this week off work, my boss told me to take Tuesday off if I liked, to travel back and avoid the Easter traffic - I have a terrific boss! :0) So, then of course it was a case of playing catch up - at work, unpacking (partly! ), washing, washing ... oh and some more washing!! We had friends stay in our house over the weekend while we were away, so ... more sheets and towels etc. Plus, there always seems to be loads of washing to do after being away - not sure how that works - do we wear more clothes while we're away?!?! One of life's little mysteries - right up there with where to pens disappear to when you need them in a hurry and what happens to the second sock when you put a pair in the washing machine and only one comes out?!?! Please tell me if you know the answers to any of these! Tee! Hee! Hee! Aren't those fabrics PRETTY!! 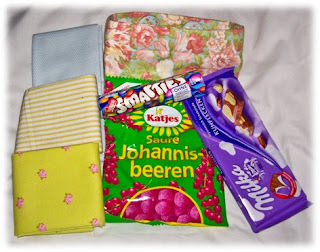 And you can see Julia has also included some sweet treats to help keep my energy high so I can stitch! At least, that's MY story and I'm sticking to it! :0) There's some yummy gummy lollies that are, I think, cranberry flavoured, a lovely mix of sweet and sour; some German Smarties (kind of fun to see chocolates that we see in our shops with the wrapping written in a different language!) because Julia knows I like dotty things and a chocolate bar called "Kuhflecken" and Julia tells me this literally translates into English as "Cow spots" - because the milk chocolate is covered with white chocolate kuhflecken ! Tee! Hee! Hee! How cute is THAT!! And I looooooooove white chocolate! Thank you so much for my sweet present, Julia!! I really have been spoilt by my blogging buddies this birthday!! 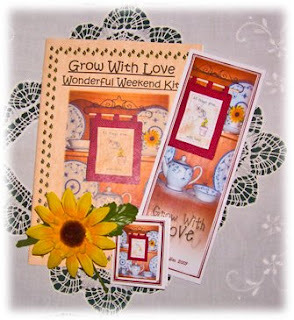 The winner of the "Grow With Love" Wonderful Weekend Kit is ... JANICE! Enjoy, Janice! 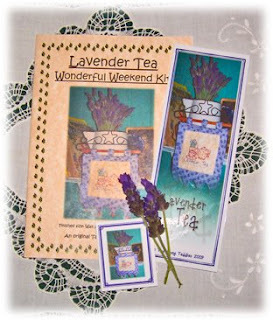 And lucky last, winner of the "Lavender Tea" Wonderful Weekend Kit is ... JOY!! Hope you enjoy this 'brew', Joy! Oooooooooh! A red butterfly!! Butterflies are just so cheerful, aren't they, spreading joy and beauty with their rainbow-coloured gossamer wings!! OK, enough poetic stuff!! If you're lucky, I might share some more sneaky peeks again soon! Hope you all had a wonderful Easter and that your weekend is filled with fun! Til next time - Bear Hugs! OK, as promised, I'm back with a SUPER GIVE AWAY!! So ... 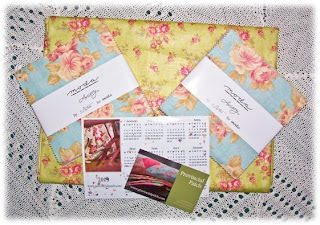 I will be giving away one each of these five patterns. All you have to do to be in the prize draw, is to leave me a comment on THIS post telling me about your dream/ideal weekend - things like: what would you do, where would you go, who would be with you, what would you eat (always important, right!!). And you have just over a week to do this. Entries in the draw will close on Friday April 17 (Australian Eastern Standard Time) which may mean my overseas friends need to leave their comment by Thursday April 16. 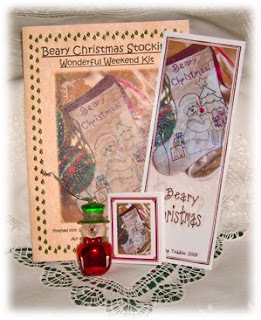 I'll draw four names out of the hat, and they will receive the prizes in the order they are in the photo - so first winner gets "Girl Stuff", second gets " Beary Christmas" etc. Hope that's not too confusing!! I'll contact the winners by email (so please make sure you include your email in your entry if you're a "No reply" blogger) and then post the winners names on Saturday. PHEW! There's a lot of work to a give away!! :0) So now ... GET COMMENTING!! And now, I'm off to gather up my sewing gear and pack a port (suitcase!) because we're heading off to visit my parents for the Easter weekend, while friends come and stay in our house to attend the Easterfest music festival here in Toowoomba. I'd like to wish you all a happy and safe Easter and hope that as you enjoy the holiday, spend time with family and friends and enjoy your Easter gifts, that you remember the priceless gift that Easter commemorates! Til next time - Bear Hugs! I know it's only Wednesday and there's a few days left in the week, but I've had a really good week! It actually started last Friday when I went to lunch with my dancing buddies Lynda and Deb to celebrate Lynda's birthday - it's exactly a fortnight after mine, which makes us almost twins! Hmmm ... yes ... only our mothers could tell us apart!! :0) To show you just how silly that is, I'll pop in a photo of the Lynda and I at Lynda's birthday celebrations last year. (mainly cos I forgot to take my camera to Friday's lunch!. 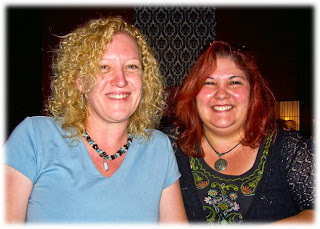 Now, when Lynda, Deb and I get together it's always fun, but last Friday we just had the BEST time! And LAUGH!!! We all went away with sore cheeks and stomach muscles from laughing so much - much to the disgust of the elderly ladies sitting behind us who obviously didn't have a sense of humour and gave us VERY disapproving looks all through lunch - which we completely ignored! :0) Even though it was Lynda's birthday, I got a giftie too - a slightly late one from Deb and it was worth waiting for. 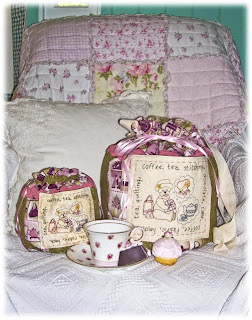 A pretty tea cup and matching teabag caddy featuring native or false sarsaparilla - how pretty are they!! 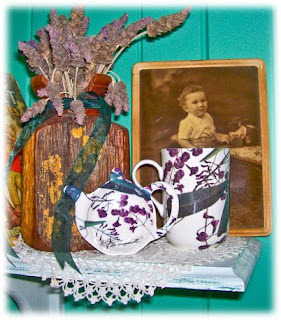 I love the deep green and deep purple colour combo - I sure will feel pretty special sipping my tea from this cup!! Thanks Deb! Isn't this a pretty set! The style is a little more conservative than I usually wear, but the red is so vibrant that I may just have to find something it goes with. 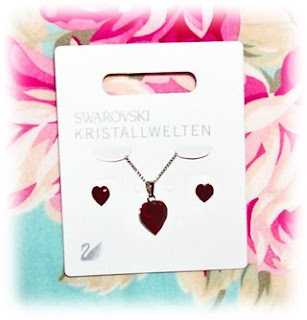 As you can see on the jewelry tag, the pendant and earrings are set with Swarovski crystal. Now, Bohemian though I may be, I HAVE heard of Swarovski crystal and my MIL picked this little set up when she and my FIL were overseas at about this time last year, so now I have some internationally famous jewelry! Tee! Hee! Hee! OK, so that's the gifties from my title, now onto the goodies!! I've been stalking my postie for a few days waiting eagerly for this package to arrive and yesterday it appeared in my mailbox! Yes ... 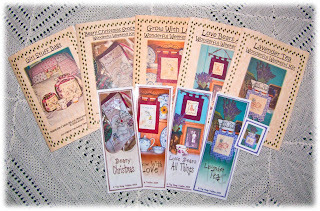 I've been eyeing off the pretty shabby chic colours of the Aviary range from Moda for quite some time, so when I was cruising around Julie and Kerri's Provincial Patch on-line store last week and saw these pretties for such great prices, I just HAD to order some for my very own self!! 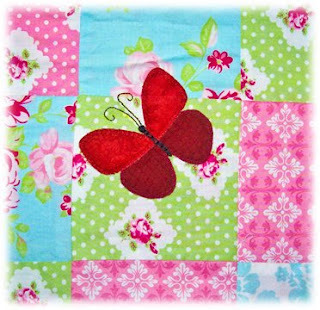 The plan is to make a quilt for my Mum for her birthday or Christmas ... I won't say WHICH birthday or Christmas, mind you! Tee! Hee! Hee! 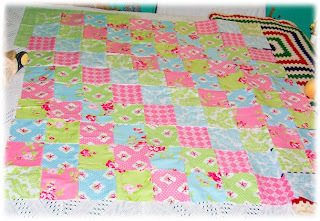 I saw a gorgeous quilt over at Peg's blog that she made with two charm packs and a metre of matching fabric, so that's what I've got ready to go here. For now, I'm just going to admire them!! Thanks for sending them my way so quickly, Julie!! And look at the cute calendar she popped in, too. It's just the right size to pin on my inspiration board in the office here, so I can keep track of how many days I've lost!! 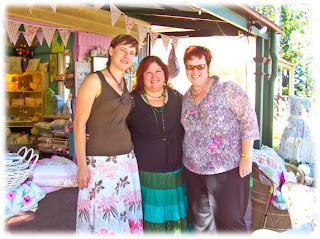 Pop over and see what Julie and Kerri have in their little shop - I dare you NOT to buy something! Tee! Hee! Hee! Ta Da!! The windmill is a symbol/logo that is on anything to do with Brownesholme, as the village has been built on a property that used to be a dairy farm and the original windmill now stands near our community hall as a garden feature, as well as a reminder of where it all began. 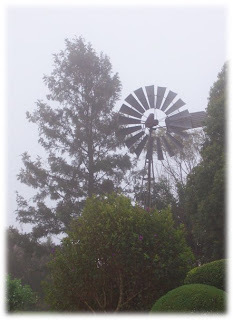 Here's the real-life windmill on a misty morning. As promised, I will be launching the "Girl Stuff" bags pattern, as well as re-launching a new-look range, so make sure you pop back and don't miss your chance to go in the draw. Until then ... my there be gifties, goodies and all round fun things in the rest of your day! Til next time - Bear Hugs! Wow! It's Sunday afternoon already - the weekend sure has flown by at super-sonic speed!! 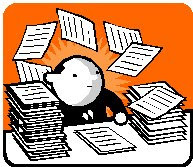 I've managed to pack a fair bit into it, though, so I guess it's time to go back to work in the morning for a rest - Anyone else feel that way?!?! Tee! Hee! Hee! Well ... the first big news for our weekend was ... IT RAINED! YAY!! Here in the Toowoomba area, we're in a bit of a 'green drought'. 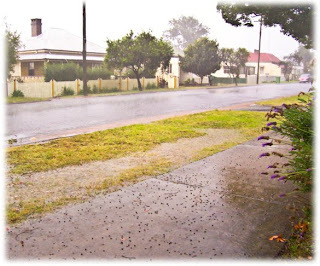 That may seem a little contradictory, but all it means is, we get small falls of rain that are just enough to keep the grass green and gardens happy, but none is substantial enough to fill our dams - DAM!! So when it started PELTING down late yesterday afternoon, we were pretty excited! OK, I was excited, Scott ended up looking like a drowned rat due to the fact he's driven home in it (well, he didn't actualy get wet whilst driving! ), then had to open the gate, drive the car in, then close the gate, then get stuff out of the boot ... He looked like a drowned rat by the time he came inside!! Tee! Hee! Hee! I mean ... "Oh dear!" I, on the other hand, was out on the verandah trying to get some photos!! This is what our front footpath was like - can you see the 'river' overflowing the path and onto the grass? 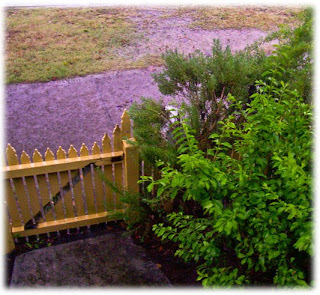 I don't know if you can see if from the photo, but it was still raining rather heavily when I dashed down the front steps to the gate to get a better photo of our footpath 'river'. Hmmm, actually, now that I look at that, the 'river' was flowing BESIDE the footpath! We had about 180pts (45mm), which when added to the 120 pts (30mm) we had on Friday, makes a nice drop of rain - hope there's some more to come and hope some of this lot went into our dams! A girly bear!! Isn't she a sweetie!! I'm REALLY happy with how this quilt is coming together!! It may be taking a bit longer than I'd hoped (cos life keeps interfering!!) but I am very excited about how I think it will look when it's finished - stay tuned! And speaking of tunes ... sort of!! I found time this afternoon to audition to be part of a theatre restaurant program which will be held in October. It's called "Murder At The Music Hall". During an evening's performance at the Music Hall, a member of the audience dies - dramatically and loudly! :0) It just so happens that a detective and his constable are in the audience and begin to investigate ... while the show goes on around them!! I've been cast in the role of "Big Lil" - Owner of the Music Hall. Now that may seem enough to have kept me busy for the weekend, BUT ... I also spent some time revamping a number of my existing patterns into a slightly new (and I think better!) 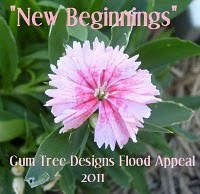 format, as well as preparing the "Girl Stuff" pattern for it's big launch. So stay tuned ... there will be a photo launch right here this week and of course, everyone knows that means ... A GIVE AWAY!! OK, I think THAT was as much as I could fit into the weekend, and reading it back, I think I deserve a cup of tea and a 'feet up' sit down with a book! 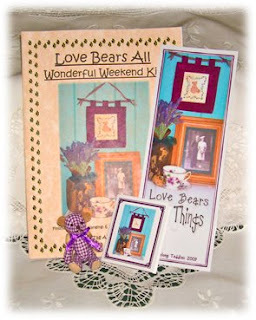 Hope you've had a productive weekend too and til next time - Bear Hugs! ... will be winging its way to her door! 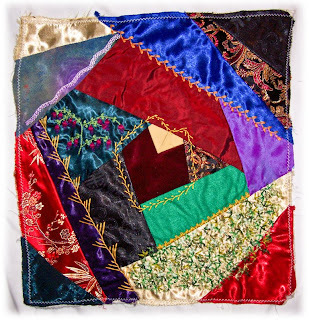 There's a GORGEOUS quilt pattern by Material Possessions (one I myself have been eyeing off! ), a handy notepad featuring some of our Australian birds, a cute Koala laser-cut timber button (created by Lisa at Button Bliss) which you can just see down near the frog on the notepad, a handy mini Sharpie pen and a matching lollipop for a sweet-treat energy boost so Sigrun can get stitching again for April. Hope you enjoy your goodies Sigrun! Once again, thanks to everyone who emailed with with a list of or the final tally of their month's finishes - this was such a BIG help to me. As much as I love flitting around your blogs for sneaky visits to see what everyone is stitching, 277 is a LOT of blogs to visit within a day or two, so I can use all the help I can get! 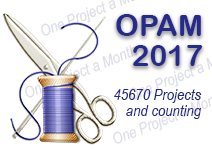 :0) Between us all this month, we completed 577 projects!! WOWSERS!! How impressive is THAT!! Well done to everyone who crossed at least one WISP or "To Do" item off their list. And for those of you who didn't have any finishes - don't despair!! There's always next month!! 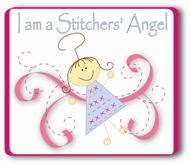 Not only does life interfere to stop us stitching from time to time, I know some of you are working on bigger projects that will take a while to finish, so if you've made even a little bit of progress, that's terrific!! I hope you're all enjoying being part of the OPAM Challenge - I know May Britt and I love to see how clever all of your creative, clever chooks are!! GIANT FRECKLES!! The bus tour Grandma was on included a visit to a small hand-made chocolates shop, so she bought me a freckly birthday treat! Now when I first took a photo of these giant freckles, it occurred to me that you might think I'd found a really small tray to display them on. (actually, it's one of my gorgeous Kerryanne English originals!!) So ... I put a ten cent coin on the plate for comparison. 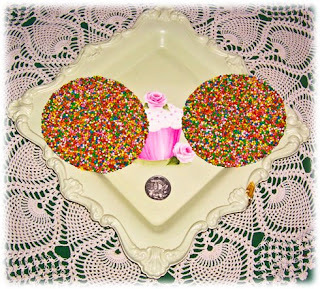 I didn't think to measure the diameter of the freckles (too busy thinking of all those yummy hundreds-and-thousands!!) but the coin is an inch across! Mmmmmmmm ... FRECKLES!! Why am I suddenly feeling like the Cookie Monster from "Sesame Street"?!! Tee! Hee! Hee! Well, that's all from me today, but I've been doing a little bit of stitching on the sample for a new pattern and I'm hoping to share some sneaky peeks on the weekend, so stay tuned! Til next time - Bear Hugs!